Delly, you turned 17 months old last weekend. This has been a really fun month with you, mostly because you've started really singing. You have been sort of sing-song babbling for a while and sometimes it sounded like you were mimicking songs that we would sing or that your toys would play. Now there's no doubt about it, though. Your favorite song to sing is ABCs -- sometimes you sing B for every letter, sometimes it's sort of a generic "ah" sound for them, but strangely the one letter you usually belt out correctly even if you're grunting the whole rest of the song is G. ?? We beg you to sing for us all the time, but you like to taunt us and only give in once in a while. You have a little mini keyboard karaoke thing that Grandma and Grandpa gave you and when you were sitting with it in your lap this morning, you were saying "oh-ee-oh" over and over, and we finally realized that you were trying to sing "ee-eye-ee-eye-oh" from Old McDonald. A few weeks ago you popped a molar. You have the front 4 teeth that all came out within just a few weeks of each other several months ago. We always feel around the front of your mouth for the next ones and there has been no sign of them whatsoever. 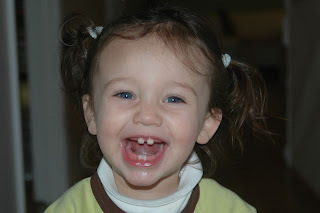 Then when we were having lunch one day Daddy thoroughly checked your whole mouth and discovered that a top molar had broken through and we didn't even know it. I can feel the one on the other side getting close too. You have some crazy teeth, girl! Last week for the first time, you grabbed my hand and started leading me around the house. A few hours later you did it with Daddy too, and now you do it daily. Most times you have no obvious destination in mind, you just lead us up and down the hallway, into and out of different rooms. Our own little leader. You've become extremely particular about what books we read to you at bedtime. We have always just picked 3 books ourselves, Daddy has his set of regular favorites and I have my own, and you never really cared one way or the other. And then last week that all changed one day. Every book we usually read to you, you rejected with yells of "No!" and slamming the book shut. One night there wasn't a single book you'd accept, so you got none at all. I try to get you to pick the books you want yourself, and sometimes you do but sometimes you just take too long so I try my own picks. For days you'll reject Curious George and the Bunny, and then one day you'll be fine with it. You'll love Jamberry every day and then flat-out reject it another day. No rhyme or reason that we can detect. And you're definitely more interested now in participating in book-reading, looking for and pointing out certain things on all the pages and saying "hi" or "night-night" to characters in the books. You say "night-night" to us now, too, though usually only when prompted by us. You always have a binky in your mouth at bedtime, and we tell you to say "night-night" and we yank your binky out so you can talk. You think that's so funny, so you give us your sweet quinty-eyed smile and say "night-night" in the most sweet and beautiful voice I've ever heard in my whole life. You're still very tall for your age, in around the 95th percentile, so I think that between your height and your full head of long hair, people often think you're older than you are -- including kids. When we go to Temple on Friday nights there are usually other little kids there, and during the Oneg after services you all run around. You love following the bigger kids around as they chase each other and play games. This past week they were playing hide and seek. One girl, probably around 4 years old, told you to go hide. She turned to face the wall and counted, and you just stood there staring at her. When she was done counting she turned back around and saw you still standing there and was very confused. We parents just sat there watching it all and laughing. It is so funny to see you interacting with other kids, all of you trying to communicate with each other at different levels and trying to figure out how to play with each other. I love watching your fearlessly forge ahead and stumble out into the world. Watching you carve out your own path is so special and just shatters my heart. You make me so proud to be your mother. What a sweet face. She's beautiful! I found your site from Huffmania. I'll be back to check how your girl is doing.